Saying no can be very difficult, particularly if you lack assertiveness and have a strong desire to keep others happy. Whether in business or in our personal lives, it is natural to want to appear helpful. But the downside is, say yes too many times and it won’t take long before you're overwhelmed. Not only that, while people in the office might like you, you can become the person who everyone knows will do just about everything. People can feel guilt or embarrassment when they say no, but remember, you always have the right to say no. Below is an action plan to help you say no in an assertive manner. An assertive way to say no is to start your sentence with the word no. You can also support your statement with nonverbal communication such as shaking your head. Remain calm, with a clear voice and maintain eye contact. 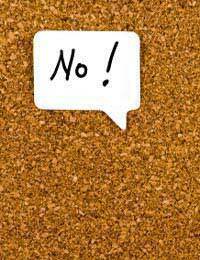 Action Plan: Practice with a friend saying no in a confident manner. Watch your tone and body language. Remain calm and friendly. It’s up to you to decide whether you think the situation warrants an explanation. If you think it’s necessary than keep it simple. For example: No, I cannot do that work for you as I am too busy at the moment. Action Plan: Practice in a non work environment to say no. Perhaps a friend makes a request of you. Say no in a polite manner giving a very simple explanation. What are you saying no to? To the task, to aspects of the tasks, to time demands? Example: I can’t do that for you today, however I can do it for your tomorrow. Perhaps you have other commitments: No, I can’t work back this evening as I have made family commitments. Action Plan: Practice giving clear and honest replies to requests. Be confident; if you have other commitments or just too busy it is fine to say so. Action Plan: Practice saying no without an I'm sorry attached! It’s only natural to fear that people will like us less if we say no, or that we will hurt someone’s feelings. Saying no does not have to result in either of these, nor does it have to cause you to feel rejected, so long as you deliver the message appropriately. If the other person gets angry or makes you feel guilty, it’s up to you to decide whether you want to allow such people to walk over you, or if you want to assert your own rights. Action Plan: Practice with a friend. Get them to be very persistent; really push you to say yes. Stick your ground and continue to say no in a confident, non-aggressive manner. Don’t allow yourself to be pressured into saying yes. It’s ok to take some time: I need to check my agenda and I’ll get back to you shortly. Think about why you are saying yes. Is it because you feel obligated? Is the person putting you under pressure? Are you the right person to be doing the work? It’s important that when you say yes that you mean it; it will have a worse impact if you say yes and then have to let people down later with a no, or to disappoint many people through too much work and then late and poor deliveries. Focus on your priorities and what’s important; spending to much time saying yes to non-essential tasks distracts you from what does need your attention and eats into your limited time. Action Plan: Next time someone asks you to do something, do not immediately respond with a yes or no. Say you need to check your agenda, then you have time to consider your response. It takes time, and a lot of practice, to feel comfortable with saying no. It’s human nature to want to be popular and to keep others happy. But ultimately if we say yes to everyone than we keep no one happy. Understand your limits and boundaries and then be assertive in your rights. Start today by getting some practice is saying no. Begin small with little requests and then start to tack some of the larger demands. Remember to stay calm; it's ok to say no.